Seoul, Korea – Groosoft has released Translate Box 1.0.1, a translation comparison and management app for macOS. Translate Box shows translation results from several famous translation services at the same time to provide optimal translations. Also, all contents of a translation can be tabulated and systematically managed. * Comparison of Translation Services – Users can compare translation results from multiple translation services to obtain the desired translation. * Tabulated Document – Users can add new boxes to create new translations, and you can create well-organized documents in table form as boxes stack. * Automatic Language Selection – Language is automatically selected and translated into the native language or secondary language according to the input language after setting the native second languages that are most commonly used. Users can translate simultaneously from multiple translation services. Translate Box can translate from the desired translation service and translate from up to four translation services at the same time to see different results all at once. Therefore, users can compare translations from multiple translation services or translate a text into four different languages at the same time. In addition, it can continue to add new translations into table-based documents to manage translations for related content without erasing existing content. Users can add new boxes to create new translations, add boxes to add new translation services, and remove boxes to remove translation services in use. Translating can be done just like writing a document and it is also possible to separate documents by subject. 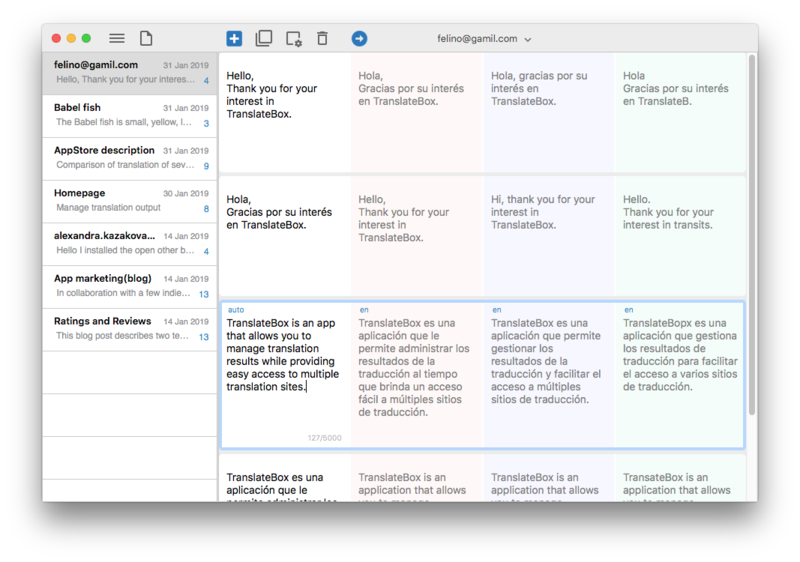 Translate Box 1.0.1 is $4.99 USD (or equivalent amount in other currencies) and available worldwide exclusively through the Mac App Store in the Utilities category. Based in Seoul, Korea, groosoft was founded by Hyoseo Park in 2011. The company develops mobile and OS X apps. Copyright (C) 2011-2019 groosoft. All Rights Reserved. Apple, the Apple logo, and macOS are registered trademarks of Apple Inc. in the U.S. and/or other countries. Other trademarks and registered trademarks may be the property of their respective owners.